Tandoori Tadka is located just opposite to the Sonaram Higher Secondary School Field , and bridges the lack of big restaurants between Maligaon and Fancy Bazar . As their name suggests , tandoori is their specialty , and definitely not bad . The ambiance of Tandoori Tadka is really nice . They must have created the place with just SPACE in mind . The place is large and can be utilized gor parties or small corporate events . The lighting was very nice but the lack of any sound / audio / music systems made the environment kind-of different (in a not – so – good way) . Seriously hope that they buy a audio system soon !! 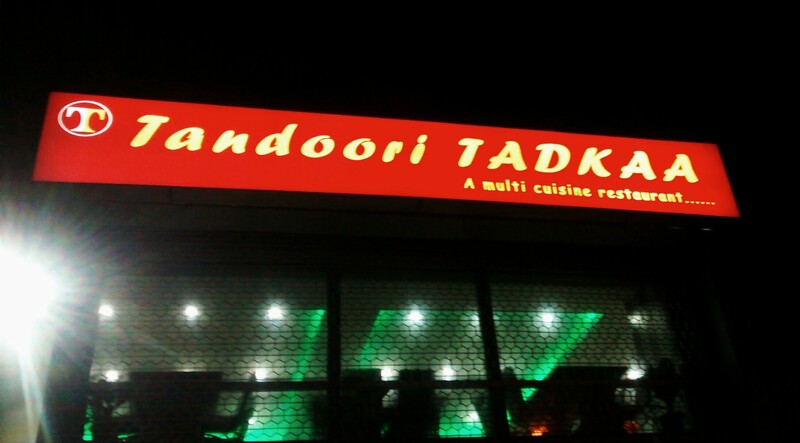 The service of Tandoori Tadka was nice . The people were quite fast and responsive . And you can always ask for the details of your dish . The food however is very mediocre in Tandoori Tadka . Firstly the quantity is very less when we consider their price . And secondly , few days back our friend had used the take away option for his chicken tikka , which turned out to be under-cooked . Therefore we suggest you to not use the packing option , and have your food there itself . And if you practice that one plate for two people idea , sorry to say but it wont quite work out here because the quantity is very less . Timing : Tandoori Tadka is open from 11AM to 10 PM . Update : This place has just deteriorated since this article was first written . Firstly right from the time we walked in , there was a particular odour inside the shop . The stink made it quite uneasy to go sit there , something very unexpected from a place like this . Secondly , they make only one type of biryani and the waiters try to pass it as Hyderabadi biryani or Kolkata biryani based on what the customer asks . Would like to disagree with you . They normally have only one type of biryani , Kolkata Biryani . And the waiters try to pass it as every other type !